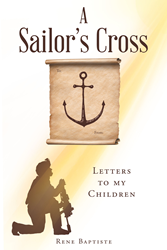 “A Sailor's Cross: Letters to my Children” from Christian Faith Publishing author Rene Baptiste is a captivating account that focuses on overwhelming emotions and intense thoughts relatable to each and every individual. “A Sailor's Cross: Letters to my Children”: an engrossing collection of verses that reflect human feelings and perspectives. “A Sailor's Cross: Letters to my Children” is the creation of published author, Rene Baptiste, a Christian husband, father, and a Veteran. Published by Christian Faith Publishing, Rene Baptiste’s new book reflects a life filled with smiles and frowns, joy and sadness, highs and lows, as well as other more profound moments such as difficult decisions and addiction. The goal of this book is to show that life is nowhere near perfection, and that every action has a corresponding consequence. Life is balanced, with dark and bright moments that influences any individual’s viewpoint about living. View a synopsis of “A Sailor's Cross: Letters to my Children” on YouTube. Consumers can purchase “A Sailor's Cross: Letters to my Children” at traditional brick & mortar bookstores, or online at Amazon.com, Apple iTunes store, or Barnes and Noble. For additional information or inquiries about “A Sailor's Cross: Letters to my Children”, contact the Christian Faith Publishing media department at 866-554-0919.